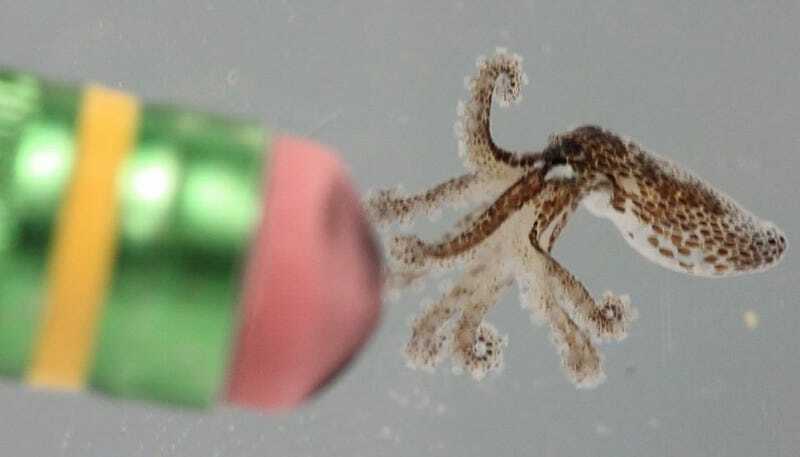 When it's fully grown, this Caribbean pygmy octopus will be just the size of a silver dollar. As a hatchling, it's dwarfed by a penny. The Aquarium at Mote Marine Laboratory in Sarasota, Florida, acquired a female Caribbean pygmy octopus (O. mercatoris) that had come in from the wild. At the aquarium, she started laying eggs, and the eggs hatched overnight between March 17th and 18th. Mote posted these photographs of one of the babies on March 19th. Because the hatchlings are so small, the hide to avoid being eaten by predators, and so they unfortunately won't be on display at the aquarium.